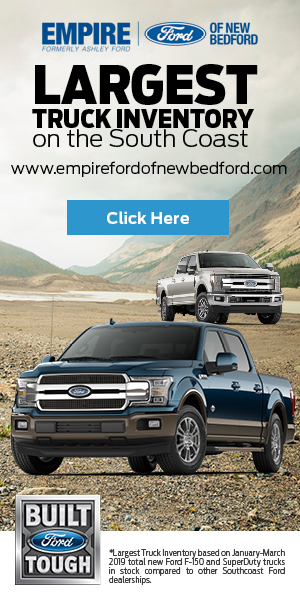 FALL RIVER – For a half-hour Tuesday evening, Fall River was not the Fall River that people across the country in the past week have been reading about in the New York Times and the Washington Post. In Mayor Jasiel Correia’s 30-minute state of the city address, Fall River was a dynamic city on the move, a community brought back from the brink of receivership under his stewardship and now poised for great things. “We have entered an era of new economic development in Fall River, an era of development for the many, not the few,” Correia said to a round of applause. Correia’s Fall River was definitely not the struggling blue collar community, written about in the national press, that has a federally-indicted mayor and the kind of dysfunctional politics that saw voters last Tuesday recall and reelect Correia in the same election. 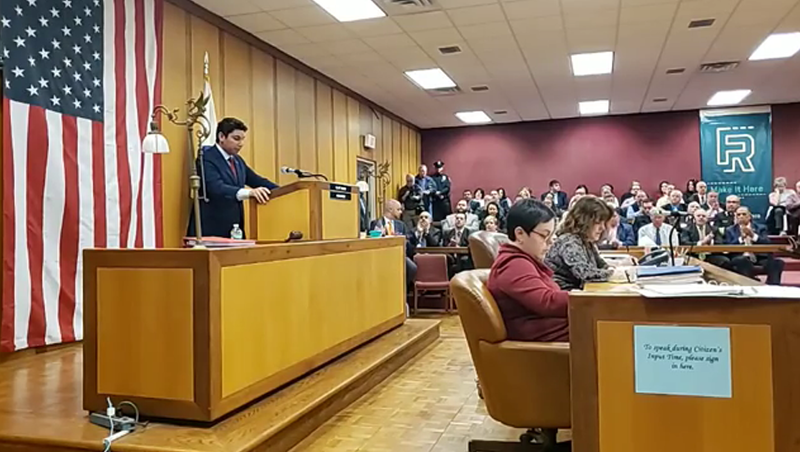 “The state of our city is strong and getting stronger,” Correia said to a city council chamber packed with his supporters, his relatives, municipal employees and elected officials, a few of whom have clashed with the mayor in recent weeks. “Our economy is strong and getting stronger,” Correia said as he touted his administration’s fiscal record and the economic development initiatives he took credit for, which included everything from sidewalk and street repairs to small businesses opening up shop in the city. “Businesses are opening up and people are moving in,” Correia said to one of several rounds of applause. Make no mistake – the media outlets from Boston and elsewhere outside Fall River that covered the 26-year-old mayor’s speech did not travel to Southeastern Massachusetts to hear about how many extra police officers he has hired or how much money the city has in its stabilization account. As he did in two mayoral debates, Correia only obliquely referred to the fact that he is facing 13 counts of federal fraud charges stemming from allegations that he scammed investors in his smartphone app company, SnoOwl. In his speech, Correia dismissed “the negativity promoted by the few.” Addressing some of the city councilors and school committee members in the audience, Correia conceded, “I know we haven’t always gotten along. Then, he urged them to “please put aside” their differences and promised “an open-door policy” with them. As Correia’s supporters gave him another standing ovation, School Committee Member Paul Coogan, who was sitting in the front row with other school committee members, had an annoyed look on his face. A few days earlier, Correia admitted in a radio interview that he had removed Coogan from the B.M.C. Durfee High School Building Committee for having run against him in the recall election. In two mayoral debates, Coogan had criticized Correia for casting a “dark cloud” over Fall River. Correia also removed School Committee Vice Chairman Mark Costa from the Durfee building committee. Costa supported Coogan in the recall election. During the campaign and in the past few days, Correia’s political opponents have slammed him for engaging in the kind of petty, “revenge politics” that the mayor called on them Tuesday to rise above. And even as Correia projected confidence and a “let’s turn the page” attitude, his opponents on the City Council and his critics in the community were not ready to let bygones be bygones. City Councilor Shawn Cadime, a staunch Correia opponent who has called the mayor a liar, and City Council Vice President Pam Laliberte-Lebeau have sponsored a resolution seeking a new ordinance that would require City Council approval for any attempts by the mayor to remove someone from a municipal board or committee that has policy and fiscal responsibilities. Cadime has also been pushing for a special City Council meeting to force Correia out of office by invoking a provision in the city’s charter. Meanwhile, a group of ten Fall River residents – including former Fall River City Councilor Linda Pereira, who ran for mayor against Correia in 2017 – filed a lawsuit Tuesday seeking to overturn Correia’s election on the grounds that permitting a mayor to run on the same ballot where he is recalled violates the city charter. “The voters of Fall River were disenfranchised. Sixty-one percent of the voters voted to remove him from office. Only 35 percent re-elected him,” said Fall River resident CJ Ferry, one of the plaintiffs. City Council President Cliff Ponte, Jr., took a more conciliatory stance, telling reporters after Correia’s speech that the mayor “brought a lot of energy,” was “very charismatic in his approach” and has a lot of passion and excitement for his position. Ponte, however, said Fall River is on a path forward not just because of Correia’s administration, but also because of the City Council and the city’s state delegation.